"Many of these loans are taken on a nearly continuous basis," Consumer Financial Protection Bureau representative David Silberman told a Senate panel in July. He and other regulators worry that deposit advances can lead consumers into a cycle of debt. "For far too many consumers, payday and deposit advance loans are traps," Silberman said. "Returning every two weeks to re-borrow the same dollar amounts at a high cost becomes a drag on the financial well-being of consumers already facing income shortfalls." Terms vary by bank, but basically, here's how it works: You borrow the money, and in return you give the bank the right to go into your account and pay itself back, plus a fee, as soon as your next direct deposit comes in. Some states have fought and banned storefront versions of payday lenders, only to find banks filling the gap. In Arkansas, nearly 300 payday lenders were operating in 2008, according to Hank Klein, a retired credit union president who became an activist against payday loans. But, Klein says, a court ruling allowed the state attorney general to drive them out. "They've been run out of the state by the attorney general," Klein says. "Well, now the banks come in and [they're] doing the same thing. They operate under federal laws, so the attorney general can't do anything." About five years ago, Annette Smith, a grandmother from California, needed money to fix her truck, so she went to her local Wells Fargo for a loan. "I asked one of the loan officers if I could make a small loan," she says. "And he said, 'We don't loan money any less than $5,000. But we do have a service that's called a direct deposit advance. And you can go home and access that on your computer and you can borrow up to $500.' "
So Smith did, and $500 appeared in her account. Smith qualified for the loan not because she had good credit — she didn't — but because she had recurring direct deposits. In her case, those deposits were Social Security benefits of about $1,100 a month. For Smith, it turned out to be a very costly arrangement. She ended up taking out repeated advances — 63 of them over five years — and paying almost $3,000 in fees. She knows now that the fees amounted to an annual interest rate of 180 percent. "If I knew that it was 180 percent interest, it probably would have caught my attention, instead of [a fee of] $50," she says. One reason why Smith didn't know her interest rate is that the law doesn't require banks to calculate it. Also, the annualized cost of the money varies by how long it takes to pay it back. Loan Or Line Of Credit? And as long as banks talk about fees and not interest, they don't need to disclose annual rates. The banks don't even refer to deposit advances as loans. Officially, they're open-ended lines of credit. Sen. Joe Donnelly, D-Ind., and bank lobbyist Richard Hunt clashed on this point at that Senate hearing in the summer. Hunt represents four of the six banks that make deposit advances. "Do you think that it's appropriate for some of the most respected banking names to be making 200 percent-plus off of their customers?" Donnelly asked him. Hunt responded, "First off, I do not accept that it's 200 percent, because it's a line of credit — it's not a loan. If we were charging 200 percent for a home mortgage, I'm with you. That's too much. This is not a loan — it's a line of credit." Donnelly wasn't buying it. "You know that's not what we're talking about," he said. Hunt said banks offer deposit advances to help consumers when they run short of cash, and that their fee disclosures are clear. "If we do not choose to help them, they have several choices," he said. "They can go to the traditional or online payday lending, which is expensive; the pawn shop, which is even more expensive; or as the Wall Street Journal pointed out recently, they will return to the Tony Sopranos, rest in peace, of the world. That is the most expensive." But when a lobbyist for the banks defends them by saying they are better than organized crime, it's no surprise that regulators had become concerned. 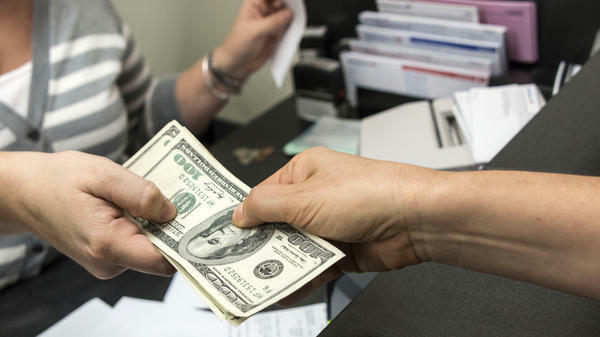 The U.S. Comptroller of the Currency and the Federal Deposit Insurance Corp., both federal bank regulators, say deposit advances pose a risk not only to consumers but also to banks themselves — in part, to their reputations. Both agencies took action, immediately affecting four of the six banks known to be offering deposit advances: Wells Fargo, Guaranty Bank, U.S. Bank and Bank of Oklahoma. Those banks, if they continue to offer deposit advances, will be allowed to lend money only once per month and not in consecutive months. They'll also have to assess whether their customers can pay back the loans and meet their basic expenses. Two other banks, Fifth Third and Regions Bank, are regulated by the Federal Reserve, which did not issue similar restrictions. The CFPB, which has broad jurisdiction over consumer financial transactions, has indicated it will take some action as well. Smith, the California grandmother, has become an outspoken critic of deposit advances since her experience, even testifying before Congress. NPR contacted Wells Fargo about her loan. Bank spokeswoman Richele Messick declined to discuss the particulars of Smith's case. But she said Smith could have qualified for a payment plan, free of charge. Nonetheless, in Smith's eyes, her bank violated her trust. "The bank is where you go, and you wouldn't be taken advantage of, you would be helped. And because they called it a service, and they called it, you know, a fee, I trusted them." After Smith got the attention of a local advocacy group, Wells Fargo agreed to forgive her last advance — if she agreed never to take another one. But she's still out the $3,000 she paid to borrow the money. When you hear the expression payday loan, you may think of one of those strip mall storefronts, you know, over by the pawn shop. They charge people high fees to borrow small amounts of cash until the next paycheck, sometimes ridiculous interest rates. But it turns out it's not only the little storefronts operating this way. Here's Robert Benincasa of NPR's investigations unit. ROBERT BENINCASA, BYLINE: They're low-dollar short-term loans and they carry the equivalent of triple-digit annual interest rates. They're like traditional payday loans, but instead of a forlorn-looking storefront with a garish neon sign, it's your familiar neighborhood bank doing the lending. A small but growing number of banks, including some major players, have been offering the loans, calling them deposit advances. That's at least until bank regulators stepped in November 21 and put new restrictions on the loans, limiting their frequency and requiring closer scrutiny of customers' ability to pay them back. DAVID SILBERMAN: Many of these loans are taken on a nearly continuous basis. BENINCASA: That's the Consumer Financial Protection Bureau's David Silberman testifying at a Senate hearing this summer. He and other regulators worry that deposit advances can lead consumers into a cycle of debt. Terms vary by bank, but basically here's how it works: You borrow the money, and in return you give the bank the right to go into your account and pay itself back, plus a fee, as soon as your next direct deposit comes in. SILBERMAN: For far too many consumers, payday and deposit advance loans are traps. Returning every two weeks to re-borrow the same dollar amounts at a high cost becomes a drag on the financial well-being of consumers already facing income shortfalls. BENINCASA: Some states have fought storefront payday lenders, in some cases banning them from doing business. Take Arkansas, for example. Hank Klein, a retired credit union president there, recalls that in 2008 the state had nearly 300 payday lenders. HANK KLEIN: And since July of 2009, we don't have any storefront payday lenders in Arkansas. BENINCASA: Klein, who became an anti-payday loan activist, says it's all because a court ruling allowed the attorney general in Arkansas to enforce a state interest rate cap. KLEIN: They've been run out of the state by the attorney general. Well, now the banks come in and doing the same thing. They operate under federal law, so the attorney general can't do anything. BENINCASA: Banks are not only regulated differently from storefront lenders, they're supposed to be different. Banks trade on reputations of stability and fairness. That's what led one California woman to bypass the storefront lenders and visit her banker. ANNETTE SMITH: I'm 70 years old - going to be 70 years old in January. I am a widow and a disabled senior. BENINCASA: That's Annette Smith. About five years ago she needed money to fix her truck and asked her local Wells Fargo banker for a loan. SMITH: And he said we don't loan money any less than $5,000. But we do have a service that's called a direct deposit advance. And you can go home and access that on your computer and you can borrow up to $500. BENINCASA: So she did, and $500 appeared in her account. She qualified for the loan not because she had good credit - she didn't - but because she had recurring direct deposits. In her case, Social Security benefits of about $1,100 a month. It turned out to be a very costly arrangement. Smith ended up taking out repeated advances, 63 of them over five years, and paying almost $3,000 in fees. SMITH: If I knew that it was 180 percent interest, it probably would have caught my attention, instead of $50. BENINCASA: Why didn't Smith know her interest rate at the time? Well, in part because the law doesn't require banks to calculate it. The loan is based on a fee, which might be 10 percent. The annual interest rate varies based on how long the loan is outstanding. So banks typically talk about fees and not interest and they don't like to call deposit advances loans. Listen to this exchange between Senator Joe Donnelly, a Democrat from Indiana and bank lobbyist Richard Hunt at that Senate hearing last summer. Hunt represents four of the six banks that make deposit advances. SENATOR JOE DONNELLY: Do you think that it's appropriate for some of the most respected banking names to be making 200 percent-plus off of their customers? RICHARD HUNT: First off, I do not accept that it's 200 percent, because it's a line of credit. It's not a loan. If we were charging 200 percent for a home mortgage, I'm with you. That's too much. This is not a loan. This a line of credit. DONNELLY: You know that's not what we're talking about. BENINCASA: Hunt says deposit advances to help consumers when they run short of cash, and that their fee disclosures are clear. Still, taking action were two big bank regulators, the Comptroller of the Currency and Federal Deposit Insurance Corporation. Immediately affected are four of the six banks known to be offering deposit advances: Wells Fargo, Guaranty Bank, U.S. Bank and Bank of Oklahoma. Two others, Fifth Third and Regions Bank, are regulated by the Federal Reserve, which did not issue similar restrictions. But the Consumer Financial Protection Bureau has indicated it will take some action as well. As for Smith, the California grandmother, she has become an outspoken critic of deposit advances since her experience, even testifying before Congress. NPR contacted Wells Fargo about her loan and bank spokeswoman Richele Messick declined to discuss the particulars of Smith's case. But she said Smith could have qualified for a payment plan free of charge. Nonetheless, in Smith's eyes, her bank violated her trust. SMITH: The bank is where you go and you wouldn't be taken advantage of, you would be helped. And because they called it a service, and they called it a fee, I trusted them. BENINCASA: After Smith got the attention of a local advocacy group, Wells Fargo agreed to forgive her last advance, if she agreed never to take another one. But she's still out the $3,000 she paid to borrow the money. Robert Benincasa, NPR News. Transcript provided by NPR, Copyright NPR.